Raw and brutal as Michael Ancher's depictions of the Skagen fishermens' battle against the elements were, equally intimate and idyllic were his interior scenes. Focusing in such paintings on the fishermen's wives and children, or on moments of leisure where the ever-wild ocean was at a safe distance, Ancher displays a sensitivity to the domestic area which is rarely seen amongst his contemporaries. In the present painting, the peaceful setting is offset by a beautiful and competent depiction of the special, stark light experienced at this northern-most point of Denmark. The harshness and danger of the sea is unimaginable, as the garden scene seems to evoke a timeless harmony. 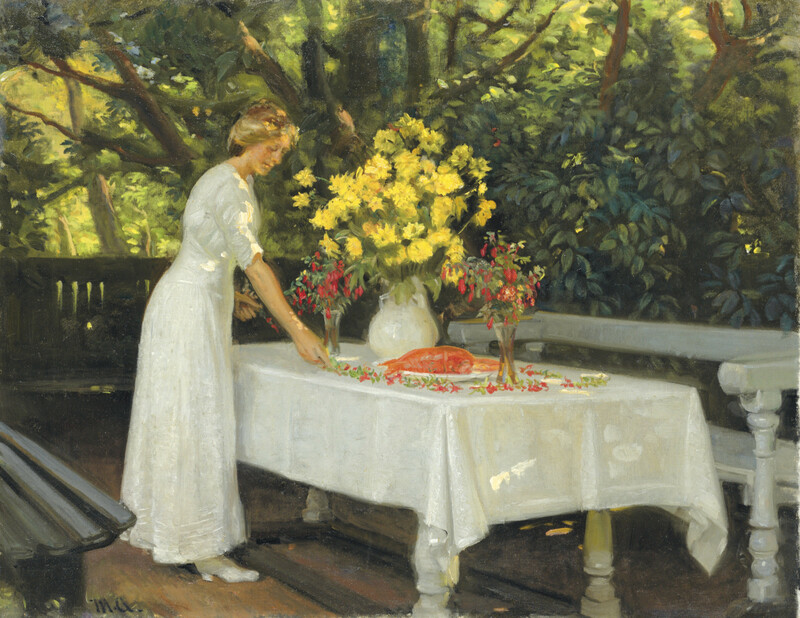 Painted in Skagen circa 1895, this painting depicts the same setting as Peder Severin Krøyer's Hip-Hip-Hurrah, now in the Gothenburg Museum.